I think another factor is the invention of the crew cab. Once trucks started coming with 4 full doors and the ability to seat as many people as a car, the crew cab truck became the family car for many previous mini-van families. The truck is much more flexible than the mini-van. Once the mini-van families started migrating to trucks, the comfort options and accessories followed. Just some breakdown. Wife and I were factory workers hourly for 44 years (retired 5 years ago). We buy for long term ownership. Last truck I bought was in 1995 cost less than $15000 base 4x4 RCSB Ranger, our income combined 35k. 2017 XL listed above paid in cash under 27k, it has nav in the form of Garmin Nuvi passed on, installed Decked Drawers $1100, Exhaust System $400, Wheels and Tires $1300, Tuner $500, Suspension $1900, Stereo $600. With misc. appearance stuff added and such, total around $34000. I didn't want 4x4, done that been there. Or a fancy interior, bench and vynil floor suit my uses. Performance, sound, appearance, all I consider my user preference over factory offerings installing accordingly. As I only have a 1 car garrage to work with, and that is occupied by a 2016 Edge Sport, the big items were installed commercially, labor included in prices above. I still get dirty with some stuff nothing heavy. I hunt, fish, backpack, and wilderness, canoe trip, general camping, hiking, Also attend 3-4 historic and vintage road races each year and never lost interest in automotive fun. This fits me perfectly, comfortably, economically. So much I put 20000 miles on the odometer first 14 months, prior driving averaged 7000. Factor in economic updates it is very comparable to our first new vehicle purchased in 1972 in cost and value. But much more reliable now! IDK, I guess at my age (56) I want to be spoiled a little , I sure don't want to go back to the days of my first F Series ! That truck had precisely ZERO options... manual steering, manual brakes, 250ci 6, and a 3-on-the-tree. 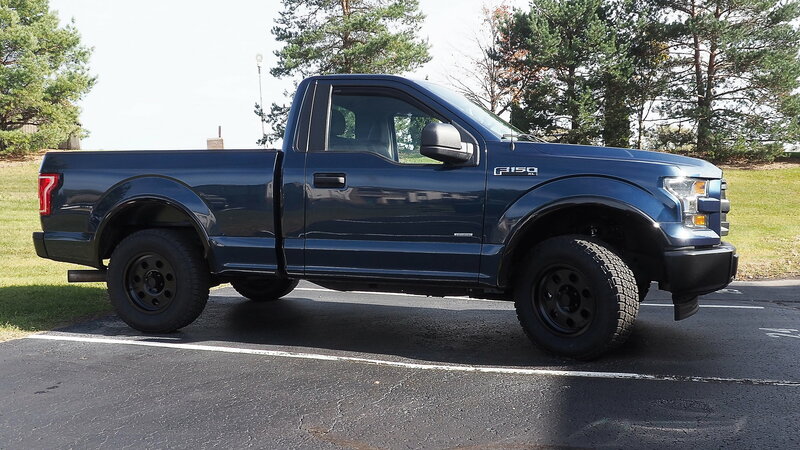 My 302a XLT is all the truck I could want options wise, just don't feel any need to go higher up the food chain so to speak. Last edited by rmc63; 02-08-2019 at 03:43 PM. IDK, I guess at my age (56) I want to be spoiled a little , I sure don't want to go back to the days of my first F Series ! That truck had precisely ZERO options... manual steering, manual brakes, 250ci 6, and a 3-on-the-three. My 302a XLT is all the truck I could want options wise, just don't feel any need to go higher up the food chain so to speak. She was a 1972 ! As an owner of both a crew can and a minivan, I completely disagree. We bought my truck back when my wife still had a Honda CR-V with the mindset that the truck would be the family hauler, and my crewcab certainly was better than the CRV. But my wife decided this past year she wanted a minivan, and I gotta say her Sienna is much more versatile than the truck as a family vehicle. Access is easier for both putting kids in carseats and letting the kids climb in themselves. The front seats are more comfortable than my F150's. Having a low, large trunk is better than my high bed, even with a hard cover on it. In a pinch the seats fold down, I could even load full sheets of plywood or drywall if I needed too. The only downside is not having a bed, but I plan on adding a hitch so I can pull my trailer for trips to the lake when we're hauling kayaks and the stand up paddleboard. We've got a 4th kid on the way, so my truck won't even fit the entire family soon unless I sold it and got one with a front bench seat. Honestly, the minivan has tighter handling and better steering response than my truck and more than enough power to chirp the tires, so I don't even mind driving it when we all go out.